Welcome to the best list of top bargains in Football Manager 2014 by FMScout.com. This is by far the most in-depth and well-presented list of cheap quality players in Football Manager 2014. I'll be updating this list often to reflect all official data updates. It took me several days to compose this list of players for you and made sure it's as accurate as possible. If you find any typos or inconsistencies, please comment. This is the first edition, including over 500 players! Updates will be applied from to time to ensure I'm not missing any players worthy of appearing here. 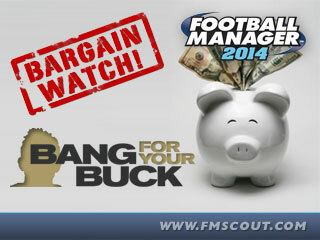 This article is the successor of our popular list with FM 2013 top bargains. ► Looking for Football Manager 2015 Top Bargain Transfers? For this list I filtered players up to the age of 29, with initial value of less than 2.5M and initial wage of less than 25K. There are no free agents here, but you'll find players who also appear on my FM14 wonderkids list. It's a recommendation system for your convenience. I'm using a 1-100 scale and I'll explain now how I've chosen these ratings based on English divisions. 26 comments have been posted so far. Have always been a fan of Olu Akinsanya the 19 year old striker from Staines Town always did wonders for my non league careers his base stats are pretty good i believe 15 heading and strength with mainly 8's and 9's in everything else he stayed in my first team for my dover athletic career all the way up to league 1 which took me 5 seasons and he developed into quite a player made a huge turn over of £2.8 million when I sold him on to Shamrock Rovers as i bought him for just £10k, he was scoring 18 goals a season and won the conference premier golden boot with 23 one year. You should give him a shot always worked for me. My first shot was 20k, immediatly accepted... guess it could have been an even lower offer. He asked for 1,6k p/w. Think this would be a great deal for any Lower League side. you should add Leke James he plays for Aalesund in Norway. he is a great player to sign. and then you have Remi Johansen who plays for Tromso in Norway he is a good player to sign to. You should really add André Hansen to this list. Really good 'keeper. Has the potential to be a star, and for the grand price of......250k! Get him early on and you've got a great goalkeeper. He's 24, aswell, so he can improve! Edit: Sorry, forgot to add, he plays for Odd in the Norweigian league. Not sure what his wage was at Odd, but I'm pretty sure it's under 25k. I may have either not seen him on the list, but whilst i was playing i picked up Leandro Damião for £5 Million which is a bargin considering in real life Tottenham had a bid of £20 Million rejected unless i there is 2 with the same name and i have picked up a different one which knowing Brazilians wouldnt surprise me, but ether i had picked him up for a bargin price OR i have a found a lil gem! Also great forums Sam good work!! Giuseppe Bellusci from Catania for 2M GBP is a great bargain - strong centreback with all the skills you could ask for, and a great return on my money - Real Madrid bought him in 2016 for 20M GBP. I actually trained him to play right-back, but same deal, and cheap. If you sign Honda up on a pre-contractual agreement and wait it about mid-August you can get him, as I described in a previous comment (the process of getting him in the beginning of your career mode), for as little as 1.2 mil (euros). JUST CLICK YES!! He is a complete player. most of his stats are 10+ and he is very versatile. When I play him on either wing as an inside forward, he proves to be a threat. However, using him in central midfield is advisable as his passing as absolutely crisp and accurate. Have fun with him. He is the perfect impact sub!! I'll post the screenshots later. I agree with the comment made above by sussexpob and would like to expand on the sentiment. Too many of the players on this list, especially the younger ones and players who are viewed as hot prospects, may have low values but will cost 10's of Millions to purchase. Their values may be low but when it comes to actually buying them they can hardly be viewed as bargains. This is similarly true for a number of players on your list, such as Oliver, mentioned by sussexpob (as was Stanciu), as well as a good number of others. Even for the players on the list who are not in demand, hot prospects who therefore cost £22 million, their purchase price varies widely and unpredictably from their value. The often vast, unpredictable difference between a player's value and his cost ultimately limits the usefulness of this list for gamers. With your list one never knows if a player shown above and valued at 100k will turn out to be an actual bargain, hypothetically costing only 500k, or if the same player will actually be an enormous expense, costing anywhere from 5M, 10M or even more. With only a player's value it is enormously difficult to predict. Therefore I would suggest putting together a more focused list that may not contain 500+ players, but would instead include players who are truly bargains in that they can be purchased cheaply at the start of the game (in the first . By providing a list low cost players, including their actual purchase price at the start of the game, alongside the player's value you would be providing a much more useful list. Ultimately that type of list would be one of the most valuable resources that could be provided for Football Manager gamers. Thanks for all the work you do and help you provide me and other FM players with your site and all of its useful content. Your efforts are greatly appreciated. Thanks. Great guide Stam, really helpful! Just an piece of advice from me, who's Norwegian and plays with the Norwegian Premiership club Viking FK; Look for youngsters in Norway and Denmark, they are super cheap and have great potensial. I found a lot of them on the list, but there are loads of players that would be a bargain. One example from FM13 is Thomas Drage (Tromsø). I bought him at my Swansea save, and in 2017 he played 1st team football for FC Bayern! Hi starting a new game with leicester on Friday (when I get the game)and not sure what budget they have? I would have thought they have got to ship the high earners ( nugent, konchesky, danns, Sean st ledger, waghorn, and schmeichael before they can buy, if that is the case and I manage to do that I was looking at reducing the wage bill considerably and replacing these players. I was just wondering who I could replace them with..
@sussexpob: Thanks for the feedback. I'll add Honda with the next update. I'll also send some scouts again on the other players you mentioned to get asking price, and if it's too high I'll remove them. Another thing, a lot of these players like Stanciu, Moi Gomez, Oliver and Suso are not bargains at all. The clubs comeback in Olivers case demanding 39 million!! Honda's contract runs out in Dec 2013, you can actually get him for free in January, or for £1.6 million before that. Stam, brilliant guide, will help a lot of people out (including myself ) Thank you. Brilliant work once again Stam! Is there anything you can't do? @thomasoj: Thanks for the suggestions. I'll check them out tonight. @Benniewijs: They can't qualify for the wonderkids list because they're both above the limit of 20 years. Casper Sloth - AGF - CM - Also starts with good skills and doesn't goes for much. Great list @Stam. Can't wait to use this years scout myself. Great stuff Stam, can defo see myself using this when the full version comes out! @PikachuFC: He's surely a great player, but his value is £4M at game start on my save. He's transfer listed and getting an asking price of £3.5M. Can you link me to a screenshot with transfer completed below £2.5M? Handcrafted in Symi, Hellas. Page created in 0.647 seconds.